Since 1972, Roland has worked to create the ultimate piano experience, and our new LX pianos are among the most exciting yet. We wanted to build a luxurious upright piano for the connoisseur, with the rich sound and graceful appearance of an acoustic, along with a multitude of advantages only possible with a digital piano. The LX-17 is powered by the latest version of our acclaimed SuperNATURAL Piano Modeling technology, along with a unique keyboard that blends wood and molded materials for great feel and durability. The flagship Roland LX-17 piano is a sophisticated instrument designed to play and feel with exceptional accuracy. It will be appreciated by experienced pianists with the most demanding of repertoire. The polished upright cabinet not only looks stunning, but also contains a powerful eight-channel sound system to capture and convey every subtle nuance. The cabinet speakers provide the all-enveloping main piano sound, and the top-mounted speakers reproduce the resonance of the piano’s frame. Two sets of nearfield speakers project the sounds most likely to be noticed by the player, including dynamic overtones and hammer noises. 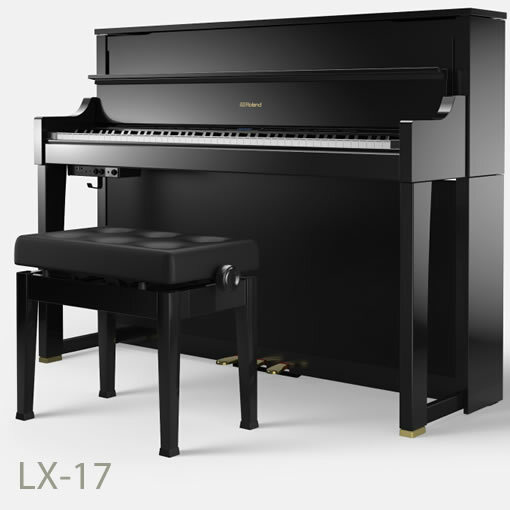 The LX-17 uses piano modeling technology in order to achieve an increased level of responsiveness and a rich sound with complex overtones that is not achievable from using static piano samples. The PHA-50 keybed combines the natural touch of a wooden key with the reliability and low maintenance of modern materials, for the core of the key. This has been designed to work in harmony with the sound engine to create the most responsive feel possible. Using Bluetooth technology, the LX-17 can wirelessly connect to mobile devices and stream music through the generous speakers system on the piano, without the need for any cables. The inbuilt Bluetooth MIDI operates the pedals to wirelessly turn the pages of your digital sheet music. By using the free Roland Piano Designer app, you can customise your piano sound to suit any performance or playing style.